I was recommended to Joan by one of her family. 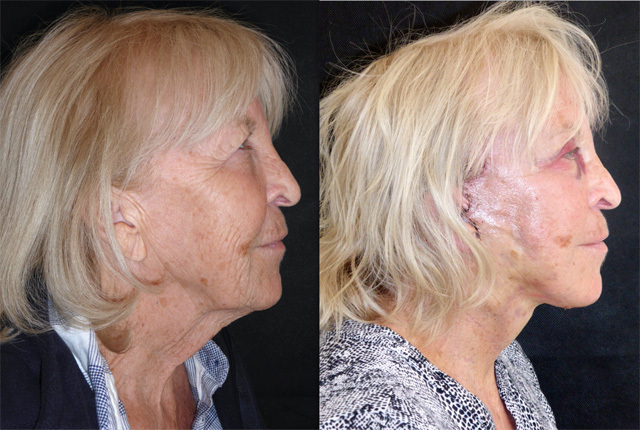 Her main concerns were the hooded eyelid skin that was affecting her peripheral vision and her excess neck skin. 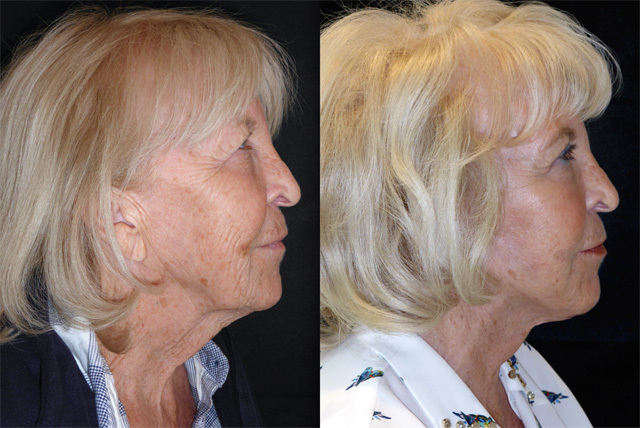 Joan lives in a hot climate most of the year and there was signs of significant sun damage on her facial skin. 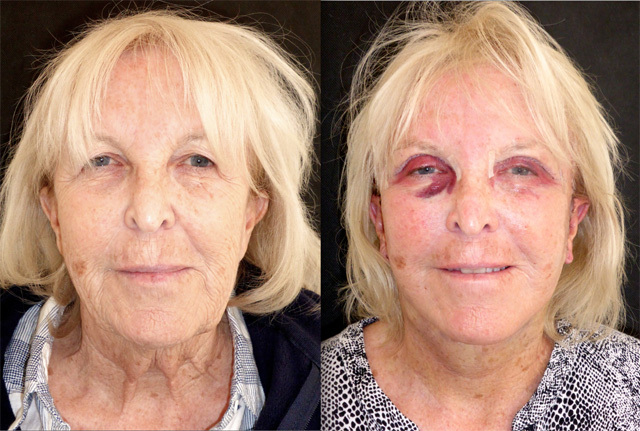 (more later) She didn’t want a general anaesthetic and long recovery so decided to proceed with a face and neck lift, platysmaplasty, sub mental liposuction, ear lobe reduction, brow lift and upper blepharoplasty under local anaesthetic. The morning after surgery and Joan has breezed through what was really quite a lot of surgery. Conscientious with her icepacks, she has very little swelling considering. Her eyelids are now visible again and her jaw and neck line defined. 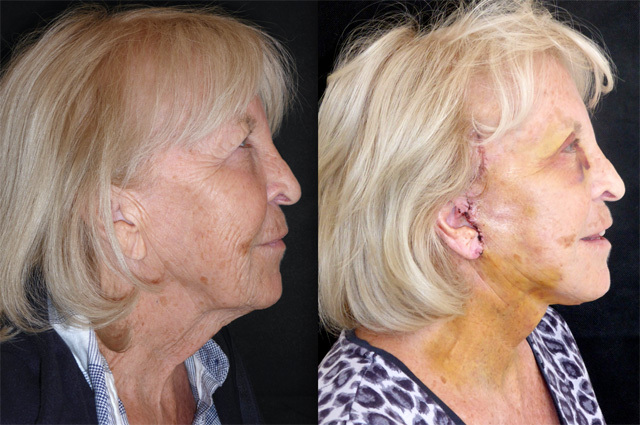 Her skin excess has been removed and earlobes reduced in size. Joan is back for removal of her facial stitches. 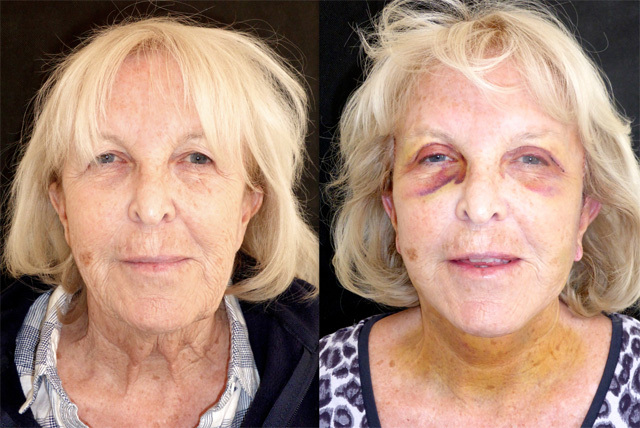 The eyelid stitches were removed at day 5 and the scars healing beautifully. Most of her swelling has now gone but the rest should dissipate in the next few weeks. Her bruising is on the way out too. 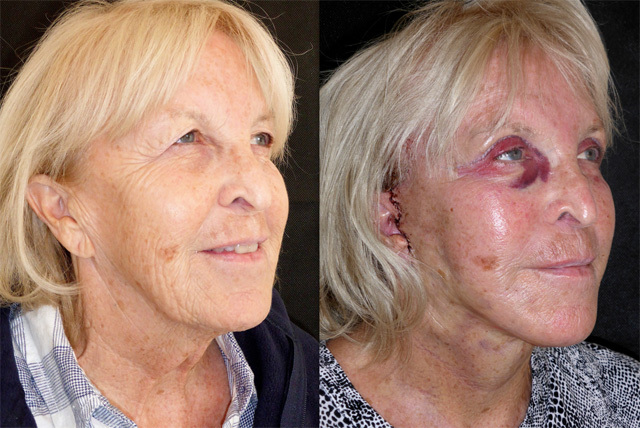 She would like to undergo laser resurfacing and renewal of her sun damaged skin, but before doing so I will ask my dermatology colleagues to have a look at her moles. 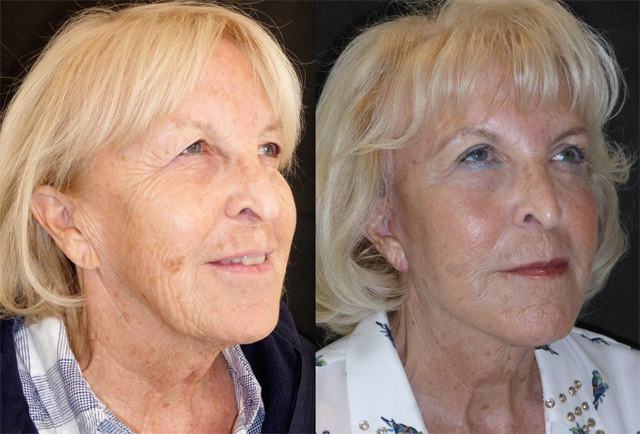 Once she has the all clear, we can proceed with improving her pigmentation and perioral fine wrinkling with CO2 laser resurfacing. Here is Joan 4 weeks after her surgery. All bruising has gone and swelling settled. 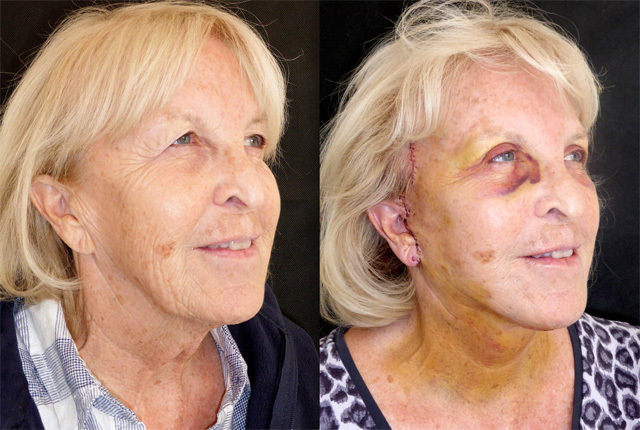 Her incisions are healing well and her face has relaxed to beautiful proportions. She is wearing eye shadow for the first time in years! 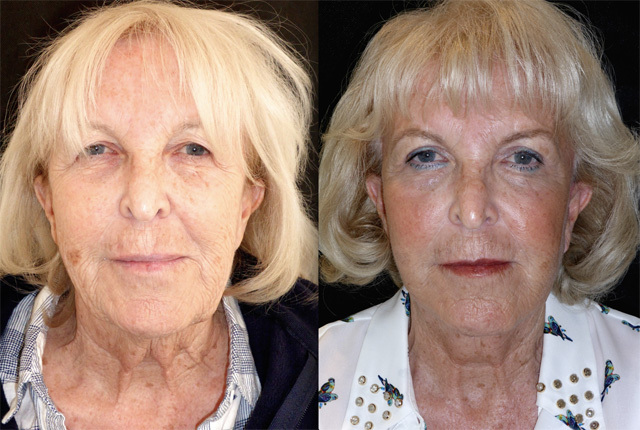 She also mentions that her eyesight seems better which is common after upper blepharoplasty for significant eyelid skin excess. Thankfully we have had the all clear for her moles so I will undertake laser resurfacing after the summer months have passed.